Think to yourselves; what’s the diagnosis & what do I do right now to help ? 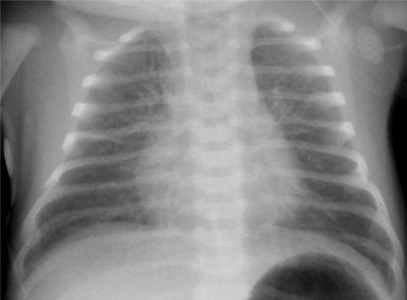 Respiratory distress in a newborn. 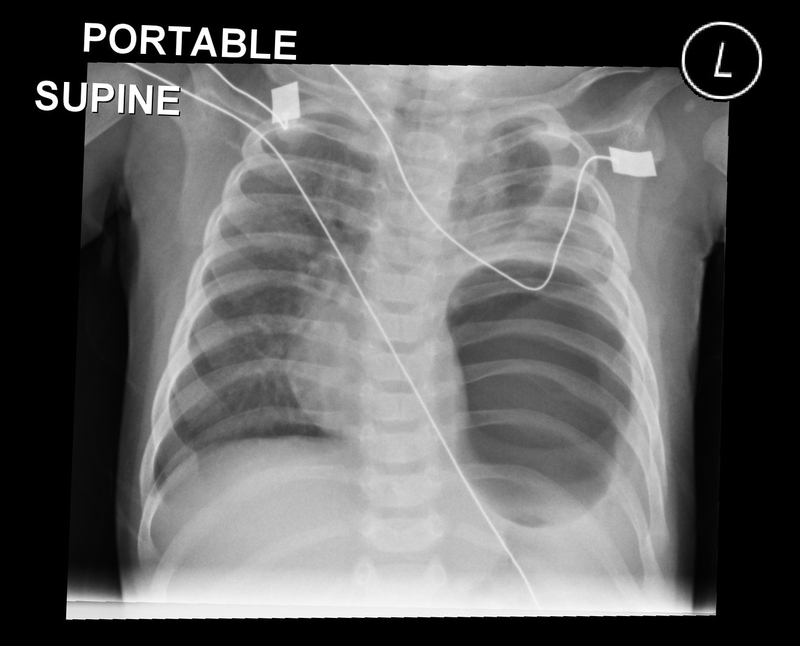 Right sided pneumothorax with mediastinal shift to the left. 4th-5th intercostal space. Anterior axillary line. ** ICC sizes taken from Clinical Practice Guideline “Chest Drain” – The Royal Children’s Hospital Melbourne. The most common cause of infantile gastrointestinal obstruction beyond the first month of life. 1 in every 250 live births. Gradually progressive vomiting –> then projectile (non-bilious). Child appears well with increased appetite. Later: visible peristalsis with firm olive-shaped mass palpable in RUQ. Characteristic “string sign,” reflecting passage of contrast material through the narrowed pylorus. Gaseous insufflation can resemble ‘double-bubble’ (as above). In late presentations shows enlarged body of stomach. Recall hypokalaemic, hypochloraemic metabolic alkalosis. 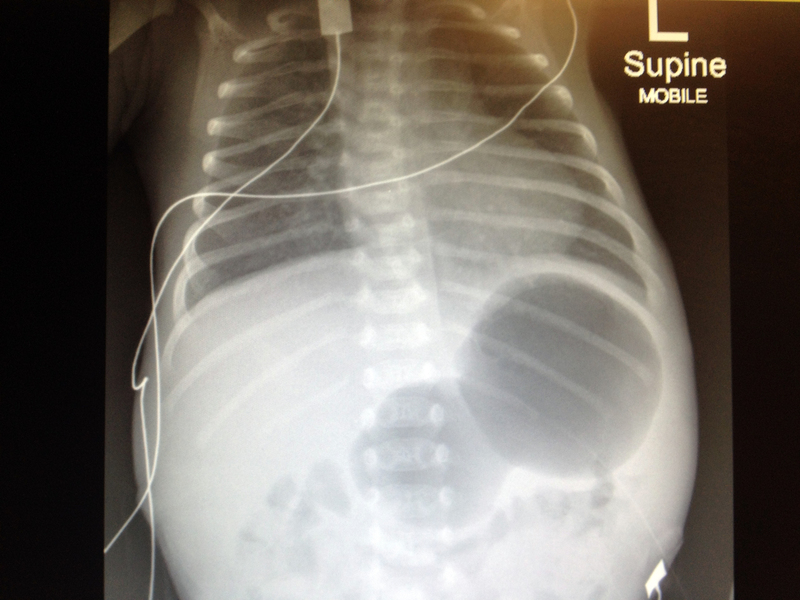 4 week old female breathless child with evidence of a recent left thoracotomy. The initial congenital form can be diagnosed antenatally. Results in intraabdominal contents entering the chest during the 2nd trimester. The ultimate determinant of morbidity/mortality is the degree of hypoplasia of the contralateral lung (& whether the liver is located in the thorax). Lung volumes of > 45% of normal predicts survival. 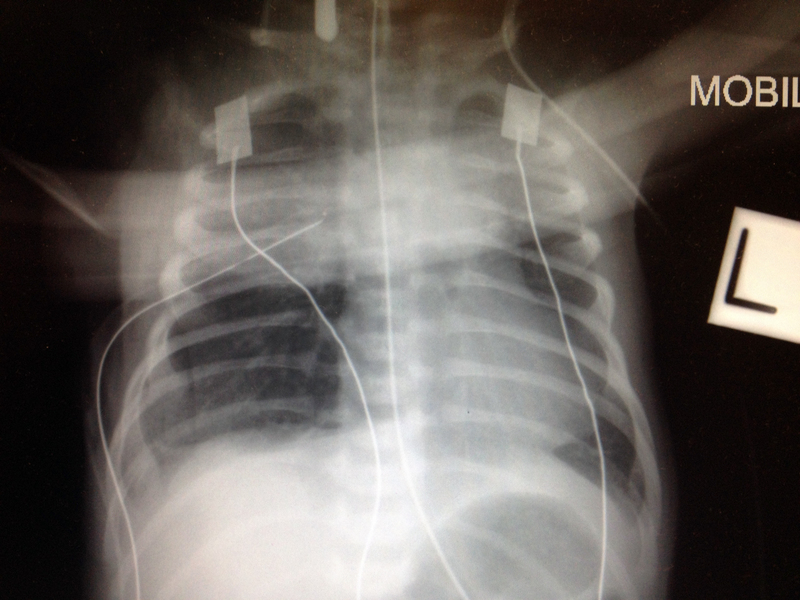 Persistent respiratory distress at birth w/ seesawing, side-to-side respirations. Scaphoid abdomen, with bowel sounds heard in the chest. Intubation (and avoidance of gastric insufflation). Aim for PCO2 30-35mmHg to reduce pulmonary vascular resistance. 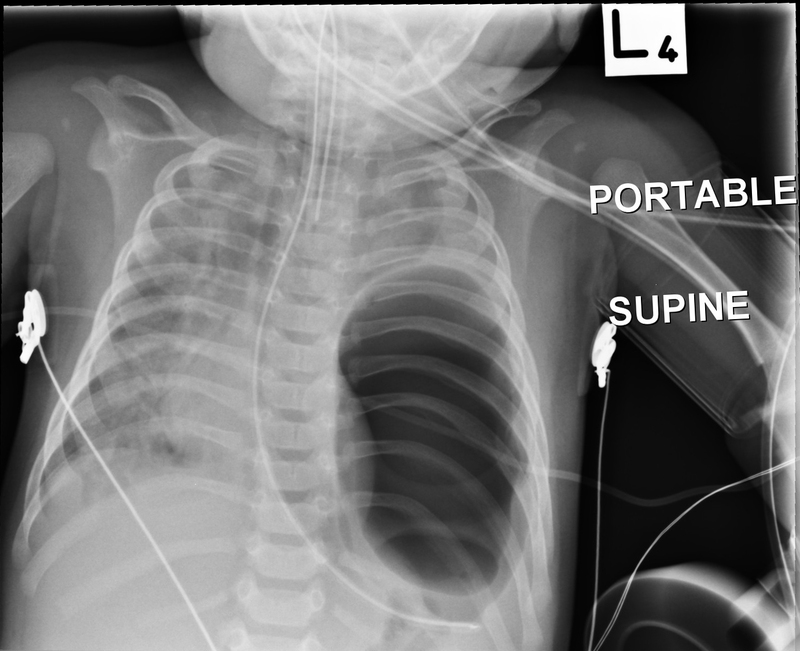 Placement of an orogastric tube. Referral to Tertiary Paediatric Centre & Surgeon for operative repair. 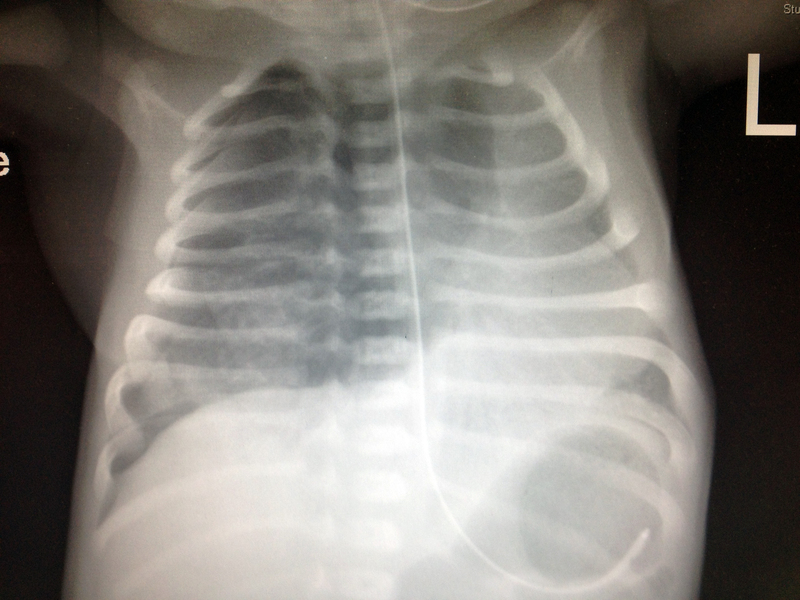 One of the most common causes of newborn tachypnoea. A failure to cease production of foetal lung fluid after onset of labour. Tachypnoea, cyanosis, increased work of breathing. Often a diagnosis of exclusion. DDx include sepsis, congenital heart disease & respiratory distress syndrome. Symptoms & CXR clears by 2-3 days. Rosenʼs Emergency Medicine. Concepts and Clinical Approach. 7th Edition. Current Diagnosis & Treatment: Obstetrics & Gynecology. 11th Edition.